This luxury residence with overwhelming panoramic sea view is currently under construction and will be built on the highest plot in exclusive and protected urbanization Vista Alegre, in San Jose and there will be only high quality materials used. Set on a plot of 2.286m2, the property offers a main- and guest house, a living area of 821m2, several open and covered sun terraces, a roof terrace, a summer kitchen with BBQ area, a guest apartment, various staff accommodations, a lovely garden as well as five fantastic swimming pools and two hot tubs. The living area of the villa is divided into a generous open living- and dining room, a fully fitted kitchen, nine bedrooms, ten bathrooms, a laundry, a media room, a library, a spa, a home cinema as well as disco. Nearly all rooms have terrace access. The elegant features and fittings of the residence include reversible air condition, central heating, open fire place, alarm system, solar heated water, double glazed windows, a lift, automatic irrigation system as well as a car elevator in the garage and various parking spaces. The completion of this luxury property is scheduled for 2016. In the direct neighborhood there are beautiful sandy beaches. 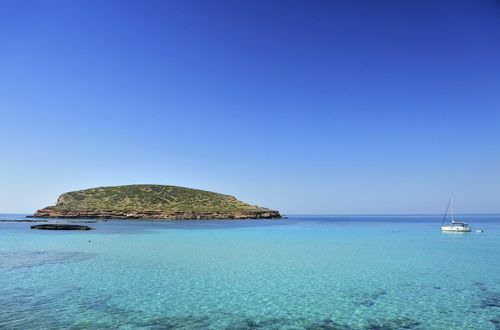 Ibiza Town with its elegant restaurants, bars and shops is also only 20 minutes car ride away.